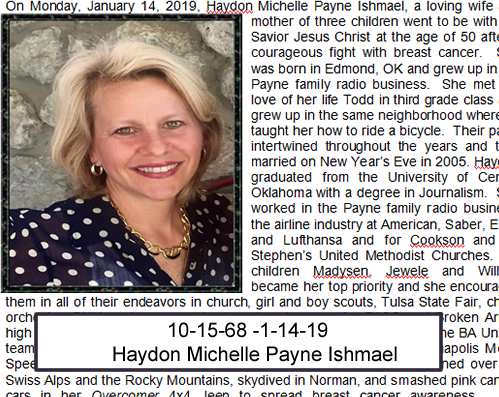 Currently the Payne family owns and operates stations in Oklahoma and Texas..
On Monday, January 14, 2019, Haydon Michelle Payne Ishmael, a loving wife and mother of three children went to be with her Savior Jesus Christ at the age of 50 after a courageous fight with breast cancer. 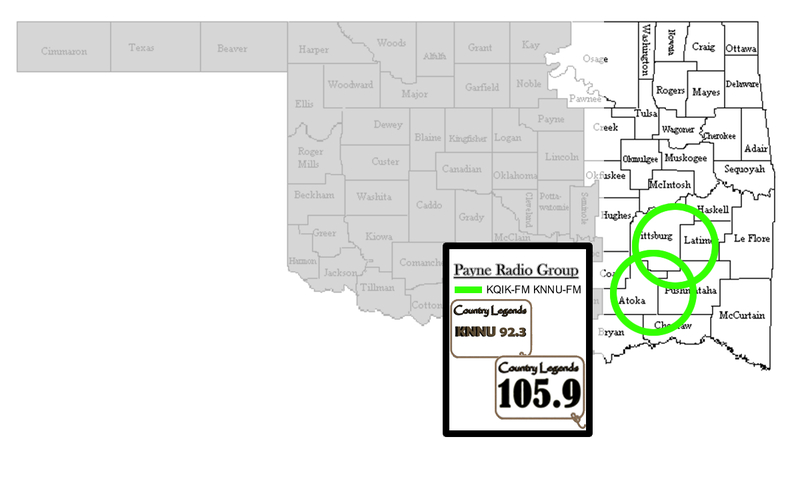 She was born in Edmond, OK and grew up in the Payne family radio business. She met the love of her life Todd in third grade class and grew up in the same neighborhood where he taught her how to ride a bicycle. Their paths intertwined throughout the years and they married on New Year’s Eve in 2005. 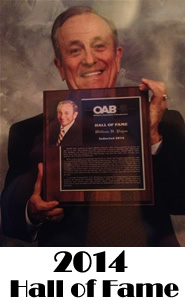 Haydon graduated from the University of Central Oklahoma with a degree in Journalism. 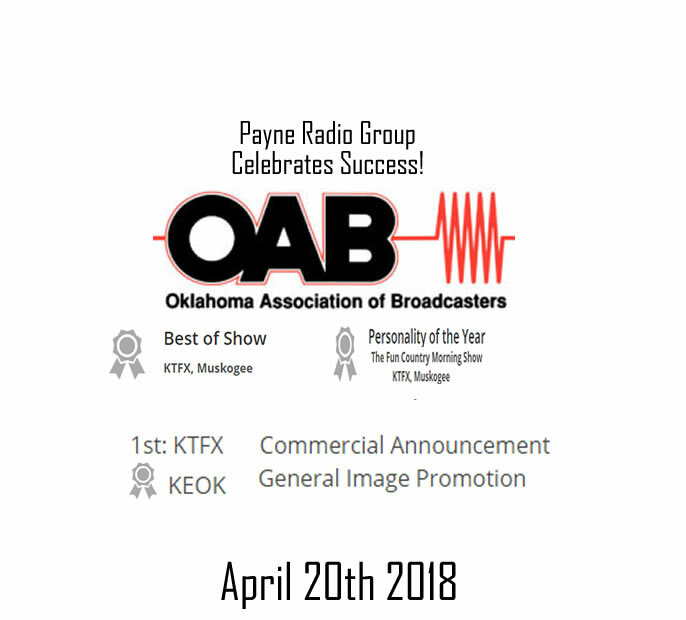 She worked in the Payne family radio business, the airline industry at American, Saber, EDS, and Lufthansa and for Cookson and St. Stephen’s United Methodist Churches. Her children Madysen, Jewele and William became her top priority and she encouraged them in all of their endeavors in church, girl and boy scouts, Tulsa State Fair, choir, orchestra, BMX, and soccer. Haydon played soccer for BASC and Broken Arrow high school, cheered her children on the sidelines, and volunteered as the BA United team manager. As an adventurer, she drove a racecar on the Indianapolis Motor Speedway and a BMW on the Nurburg, Germany track, hot air ballooned over the Swiss Alps and the Rocky Mountains, skydived in Norman, and smashed pink cancer cars in her Overcomer 4x4 Jeep to spread breast cancer awareness. Her memorabilia includes numerous photos with country-western singers, her favorite being George Strait who she met in 1981. She was an overachiever in everything: her faith, family, friends and neighbors, volunteering, event planning, acts of kindness, and work ethic. Everyone knew her, for her beautiful smile, great sense of humor and her kind and compassionate spirit. Haydon was preceded in her death by her father William H. “Bill” Payne and her father-n-law William E. Ishmael, DDS. She is survived by her husband Todd A. Ishmael, three children Madysen, Jewele, and William, her mother Gail (Curtis) Payne and her mother-n-law Penny (Cornel) Ishmael. Her siblings Anne (Payne) and Scott McGarry, Kelly (Payne) and Brad Spears and Will and Brandi Payne, Todd’s siblings Tripp and Kelly Ishmael and Thomas and Michelle Ishmael, eleven nieces and nephews, aunts and uncles, cousins and great nieces and nephews.